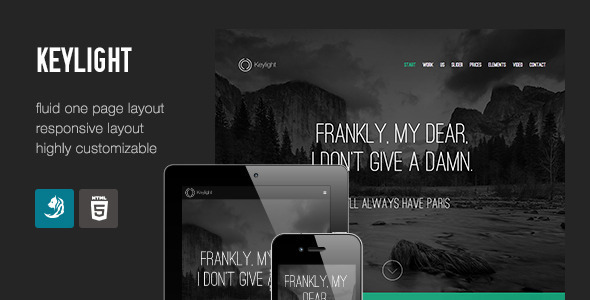 Keylight – Light & Flat Portfolio Created by TardigradeStudio. This templates have specific characteristics, namely: Keylight is a simple one page portfolio template, great for showcasing your work or for a small agency’s portfolio. It’s responsive and it’s based on LESS, which makes it highly . You can use this Keylight – Light & Flat Portfolio on Site templates category for colorful, creative, designer, flat, light, metro, modern, one page, parallax, photography, portfolio, responsive, showcase, subtle, typography and another uses. Based on LESS, easily customizable. Change all the colors in seconds. Fully Responsive – looks as great on a phone as on a desktop computer. Easily configurable map & video section. Please use the comment section if you have any support questions. Find out which version you have by opening css/main.css or css/main.less. If there’s no Version: X.X this means you’re using the base version 1.0. All newer versions have a Version: X.X line. FIX – form submission not working properly, fixed.
. If you don’t get this overwrtie process.php with the new one and set it up with your details. FIX – main navigation horizontal position for lower resolutions. If you’re updating from 1.0 copy and replace the css/main.css and css/main.less file with your current ones & js/main.js with the current one. Caution: if you’ve made changes to these files, please make a backup and then reapply them on the new files. FIX – singlePageNav now accepts external links. To apply this fix in version 1.0 update file js/plugins/jquery.singlePageNav.min.jsTo use an external link, please be sure to include a class ’.external’ to the corresponding anchor. To apply this delete clearfix class from these elements: .row, .wrapper, .content-container, .mainnav. This will be automatically fixed when you replace the CSS/LESS files. FIX – Go to top link on the logo and iOS flickering. Improved toggle button. There’s a new blog area in index.html which stands where Elements was before. Elements is now in a separate page. If you’re updating from version 1.0 make sure to open index.html from the new downloaded package and then copy the whole container that starts with <div id=”blog” class=”section content-container grey relative narrow-carousel”> in your index.html file on your website.